Looking for a way to connect with the audience in a more direct way? You can deliver your customised message over the re-broadcast to everyone with the SoundDec© earwig radio. This is a great way to extend your brand and put your company "in the game." The SoundDec© earwig radio offers you a highly visible branding opportunity on both the earpiece and the supporting lanyard. Whether you are an event organiser or event sponsor The SoundDec© earwig radio provides a unique way to connect on a more individual basis with your audience and have a highly visible presence at the event. With two prominent branding locations, you will also have valuable opportunity for potential sponsors. Sponsors are continually looking for more creative and emotional ways to connect with an audience. And given the visibility of the product and its experiential component, companies would be excited about this partnership opportunity. 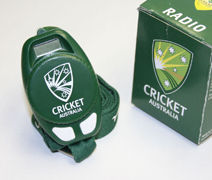 Depending on the radio type selected, the SoundDec© earwig radio technology allows for it to be used after the game is over, whether it is at the next game or another event. This ensures that brand awareness continues to grow long after your customers have left a sporting event or promotion. In addition to the branding opportunities on the SoundDec© earwig radio and lanyard, there is also the opportunity for branding on the packaging. The SoundDec© DualTune, OneTune and ScanTune earwig radios are packaged in a 2" x 2" x 2.5" (5cm x 5cm x 6.5cm) box which can be branded with your logo. 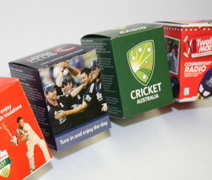 Custom printed packaging is available for orders over 1,000 units. The earpiece of the SoundDec© earwig radio can be branded with your logo, radio station call letters or any graphic design. The entire radio can be molded in your choice of colour or combination of colours for large orders. 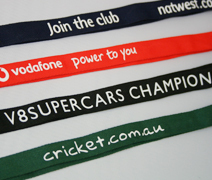 Imprinted lanyards are also available in a variety of colours.